3828 and 3839 series of 15" drivers. Below is my final schematic which is a simple as I can get it. I have made changes to several component values compared to my original schematic. All my component values are absolutely proven and correct. 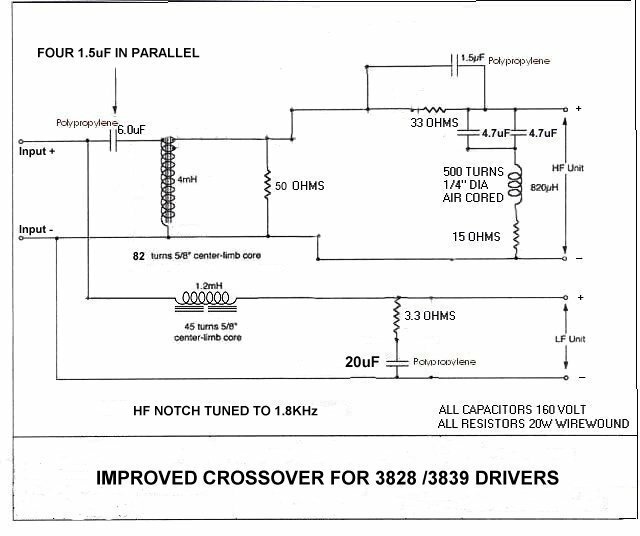 I can absolutely guarantee that this final schematic makes the 3828 / 3839 drivers sound absolutely superb. Using this crossover circuit with the Prestige hard edge upgrades gives an amazing sound quality with astonishing mid range detail. The upper treble is lovely and smooth with no aggressive effects. Anyone copying this circuit exactly will be surprised how good it sounds compared to the original Tannoy crossover circuit. © PE1MMK Hans Hilberink & Phil Short, last update: 22-12-2010.